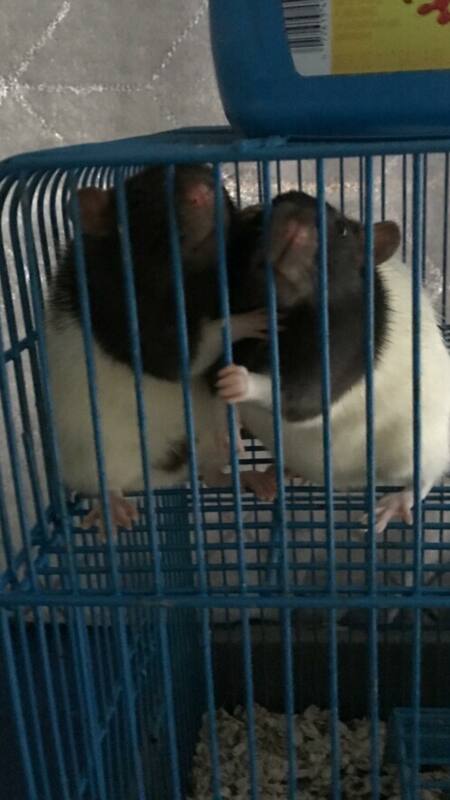 This story is by Valentina Caceres, a happy rat mom who adopted her two girls through a connection made by Rattie Ratz. I was in 7th grade when my neighbor had pet rats. I fell completely in love with them and wanted to get some. My parents refused. Like many people, they believed that rats were mean, dirty and carried diseases. As a compromise, they allowed me to get a mouse. My little mouse had his merits, but I didn’t connect to him in the same way as I did to the rats I met. Today, I’m 26 years old and have a three-and a half year-old son, Maverick. As we started considering a pet, we realized we weren’t ready for a dog yet, but that something smaller like a guinea pig or a bearded dragon could work. 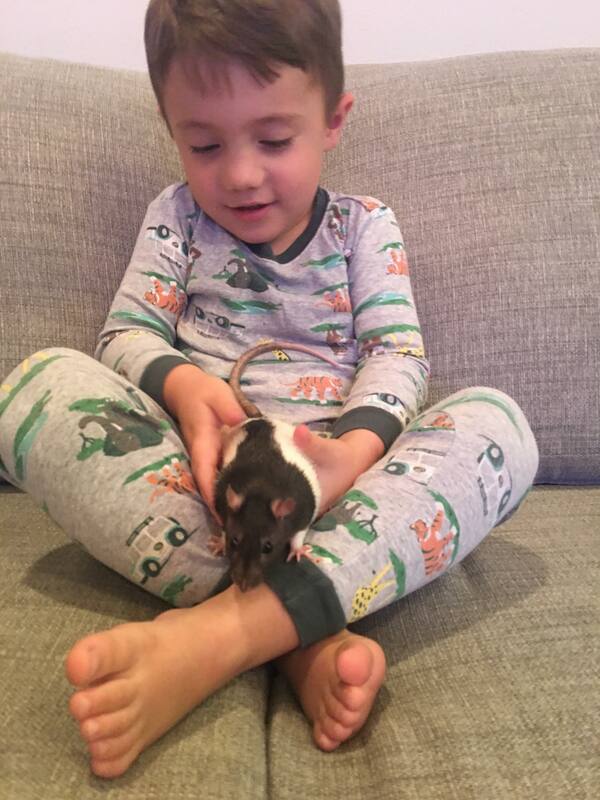 I was scrolling Facebook and saw that Alyssa, a volunteer with Rattie Ratz and a friend from high school, posted about Patrick, a rat who went from being experimented on in labs to finding a loving forever home and even falling in love. I was so moved by his story that I immediately wanted to rescue some ratties! The girls, before finding their forever home. Sadly, I’m located all the way in Orange County, a bit far from Rattie Ratz’ turf. 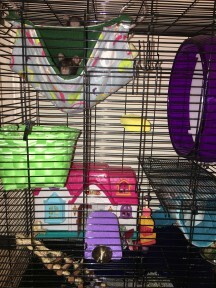 I decided to message Alyssa anyway, and the volunteers at Rattie Ratz quickly connected me to Wee Companions Small Animal Adoption, located in San Diego. Antonella, who has been working with them for many years, and who is in charge of all rat adoptions, was quick to respond to me and all my questions. She told me the rescue had two bonded sisters available who were six months old. She sent me a picture of the girls looking so sad and eager for love that we had to get them. My husband and I went to pick them up a few days later at Antonella’s home. When we got there, the girls were ready to come out of their cage. They were the sweetest. 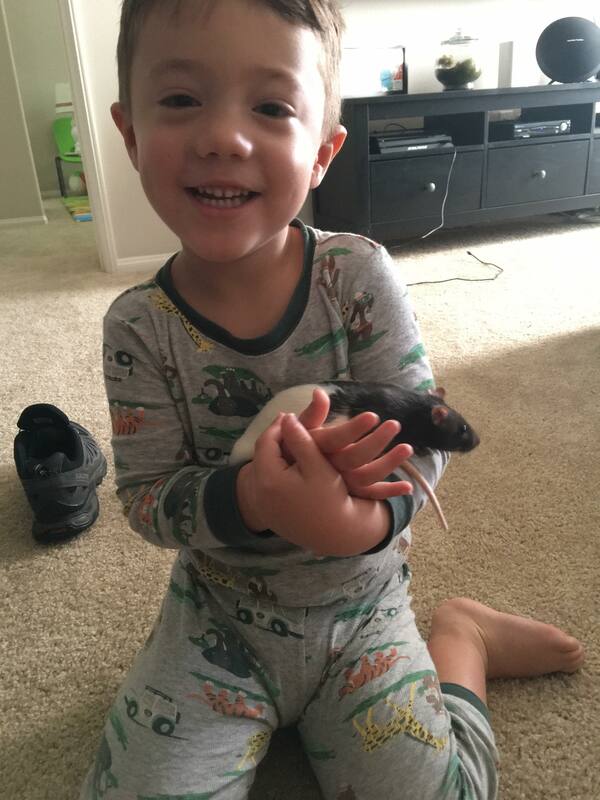 Even though he never had pet rats before, my husband loved them. Antonella had a big used cage for us to buy and had everything we needed for the girls. 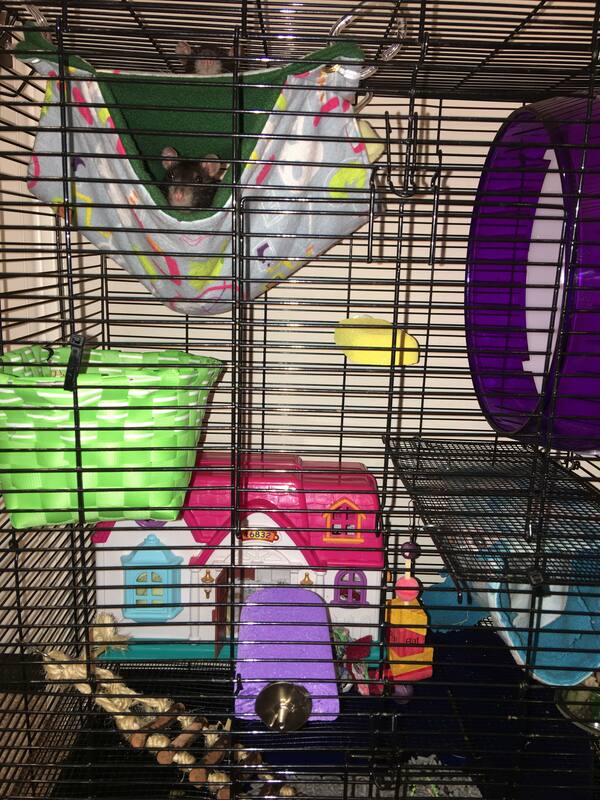 We brought them home and set up their cage, which is a mansion compared to where they were before! We’ve had the girls now for a week. I’m surprised at how clean and easy to care for they are. We gave them their space as they have been getting used to all of us and their new home. Now they’re all over the place and ready to jump out at you when you get near their cage. Maverick loves them, and he thinks they are soooo funny. He named them Rocket and Science. He wants to hold them all the time, but their little paws tickle him too much and he can’t help but crack up….so we’re working on that. Another AMAZING thing is that they’re litter box trained!! Like whaaaaat?? They have their litter box and they do their business there! They’ve had a few accidents outside; no one’s perfect. Still, I’m so surprised at how clean and not stinky AT ALL they are. Science! Or Rocket! Who can say? We’ve definitely seen their personalities pop up the longer we have them. They’re curious and love to eat! We love how they eat most of the things we eat. I’ll make them eggs in the morning and they’ll eat some yummy dinner with us at night. We’re excited to see them get more and more comfortable with us. I read that females are not as cuddly as males and are all over the place and this is totally them… but they’re so playful and sweet we don’t care if we can’t cuddle them for long periods of time. So far, they’ve been the best decision! I’m so glad we ended up getting rats. Rattie Ratz is an all-volunteer organization whose mission is to help all domesticated ratties. If you would like to know more about Rattie Ratz Rescue you can visit their Facebook page. 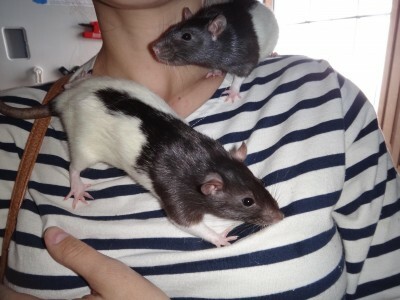 If you are interested in adoptable rats or volunteering for Rattie Ratz Rescue you can visit their website: www.rattieratz.com. Always good to read about happy rescues.